The monster is seven and a half feet tall and as strong as ten men. He has a bolt in his neck and stitches in his enormous, flat-on-the-top head. He probably doesn’t know (and wouldn’t care if he did know) that he is made up of body parts from dead people. No matter where he goes or what he does, he scares people without even trying. That’s what makes him a monster. He lives in a lonely castle on a mountaintop. He has no friends and his days are empty and pointless. His brain is not so addled that he can’t ask himself why he was ever created in the first place. He has recently taken to talking a bit and, when he’s not smoking cigars, drinking wine, or running around the countryside scaring people, he says things like, “Love dead—hate living.” This is not a good sign. The mad scientist who made him, Dr. Victor Frankenstein, and his equally mad colleague, Dr. Pretorius, see that the monster is not happy. He is not fulfilled and isn’t living up to his full potential as a monster. After much thought and deliberation, the two mad scientists decide that the monster needs one thing above all others: a mate who will appreciate him for what he is and won’t be repulsed by the way he looks or by his crude manners. They toy with the idea of creating a male mate but that just doesn’t seem the thing, somehow, so they decide they will create for him a female mate. Dr. Frankenstein sends his hunchback assistant, Fritz, out on a midnight graveyard run. From the graves of the newly dead, Fritz will get the body parts needed to cobble together a female mate for the monster. He knows just the place, he says; leave everything to him. Now, Fritz has never been overly scrupulous about where he gets what he needs. He isn’t above going to the village and, seeing a lone woman standing on a corner singing a song, hitting her in the head to subdue her and then strangling her. When he makes sure she’s dead, he puts her in a burlap bag and throws it over his shoulder and goes back to the castle. He knows Dr. Frankenstein will never ask questions as long as Fritz delivers the goods. The woman was just a nobody anyway. She’ll never be missed. 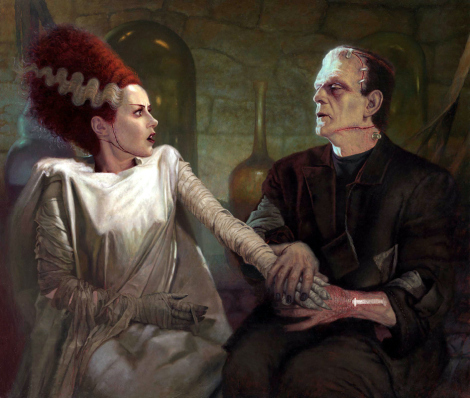 Dr. Frankenstein and Dr. Pretorius spend about two weeks creating what they think is a perfect mate for the monster. They take as much time as they need without rushing; they want to get every little detail just right. When the next violent thunderstorm occurs, they will be ready to harness the lightning. They don’t have long to wait. All day long the next Saturday the sky is turbulent and dark. Finally, at night, a fearsome storm comes down the mountain, tearing at the castle walls. The wind howls and the rain falls as if a spigot has been opened in the sky. The lightning seems to be exactly on top of the castle, as if made to order. The two mad scientists place the as-yet lifeless body of the female mate on a table, connect the conductors that will attract the life-giving lightning, and hoist the table upwards through a hole in the ceiling. The monster knows what is going on in the laboratory and paces his chamber nervously. Dr. Frankenstein has told him he must stay away until they are ready for him to see his mate. He combs his hair; he tries on several suits of clothes but nothing seems just exactly right. He fears that his mate will be afraid of him and will try to get away. He wonders if he will have to tie her up or club her in the head to be able to get a kiss from her. He lies on the bed and watches the storm out the window until there is a knock at the door; it’s the hunchback Fritz telling him that Dr. Frankenstein and Dr. Pretorius are ready for him to come to the laboratory. When the monster sees his mate for the first time he is a little disappointed. She is standing between Dr. Frankenstein and Dr. Pretorius and she’s swaying from side to side as if she might fall over. Her hair is very high off her head and frizzy as if electrified; white strands on both sides resemble bolts of lightning. Dr. Pretorius has dressed her in a flowing white gown that goes all the way to the floor. She tries to pull away when she sees the monster standing in the doorway, but Dr. Frankenstein and Dr. Pretorius hold her by the arms. As the monster walks across the room to her with a welcoming smile, she screams a piercing scream that rattles the castle to its very foundations. The monster is not put off by the scream but advances toward her. When he is face to face with her, Dr. Frankenstein and Dr. Pretorius let go of her arms and withdraw to the dark recesses of the room. She surprises the monster by hissing at him like a snake, which he finds very arousing. When she screams again, he puts his enormous hands around her throat to get her to shut up. And so begins a great romance. Dr. Frankenstein proposes a toast and they all have a friendly glass of champagne. They break the champagne glasses in the fireplace for good luck and then Dr. Pretorius, who is also an ordained minister, marries the monster and his mate so there won’t be any question of immorality going on in the castle. They all live happily for many years to come in Castle Frankenstein on their mountaintop. Eventually Dr. Frankenstein and Dr. Pretorius—even Fritz—all die because they are just ordinary men. The monster and his mate, however, live on and on. Through studying the writings of Dr. Frankenstein—and also Dr. Frankenstein’s father and grandfather—the monster has learned how to prolong his life and that of his mate for a very long time. The next thing he is working on is how to resurrect Dr. Frankenstein and Dr. Pretorius from the dead. If he is able to do that, there will be no stopping any of them. Posted in Uncategorized and tagged A Mate for the Monster, Allen Kopp, fiction, short story. Bookmark the permalink.